Solid formed wire is .098″ diameter (Ø2.5) with a bright finish. Hook has a formed retainer to hold free end closed and accommodates 1″ to 1-1/4″ diameter (Ø25 to Ø32) curtain rods. Grasping hook in both hands, use the thumb of one hand to push the hanger hook in and to one side. Release thumb pressure allowing top hook to bypass and extend over the bottom hook. 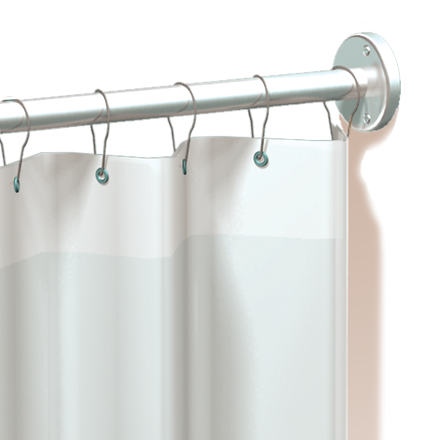 Slip the hook over the shower curtain rod (specified separately). After hanging shower curtain (specified separately) use thumb pressure to replace the free leg of the hook onto the bottom hook leg-retainer.